Are you a group leader? Can't find a group? Start with your workplace, your church, local senior centers or clubs. Place posters in your local grocery store, laundromat, etc. We can provide the flyers and posters for a trip that interests you. We'll even put your name on the flyer as the contact person! 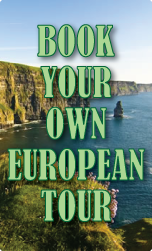 Take a look at our tours or create your own. We can post your tour on our site as an active group under the "Looking for Passengers?" section. Watch the people sign up! Its a great way to make some money and earn yourself a free trip at the same time!